Some jewellers are privileged to have a history, a long life in which they can abundantly foster their creative inspiration. They had all the necessary time to build up an image, a durable and recognizable style. Their jewels whisper this heritage and even the modernist creations always give you the clue that connects them to a history, their history. Some jewellers are privileged to have a history, a long life in which they can abundantly foster their creative inspiration. They had all the necessary time to build up an image, a durable and recognizable style. Their jewels whisper this heritage and even the modernist creations always give you the clue that connects them to a history, their history. End 2015, the playful and clumsy baby panthers from Cartier distributing presents fallen from the sky has given place to another story. The jewellers’ new ad film, produced using “Diamonds are a Girl’s Best Friend” successfully re-interpretated by Karen Elson, is a tornado. In this anthem to the City of Light and to the light of diamonds, Cartier is making the radiant artist swirl, accompanied by a group of dancers in a surreal Paris submersed with diamonds. A way to remember that the” Kings’ Jeweller” is also the jeweller of diamonds in any size, shape, form and that its style left an imprint on every era. This is the case of the Art Deco period for which we owe Cartier numerous jewels crafted in that style. This style is the signature of perfect equilibrium, as the one we find in this diamond necklace perfectly balanced with its receding line enlacing the neck. The knitting work linking one diamond to its neighbor by a platinum thread forms a perfect mosaic, as supple as fabric. This Art Deco spirit is also found in Chanel. 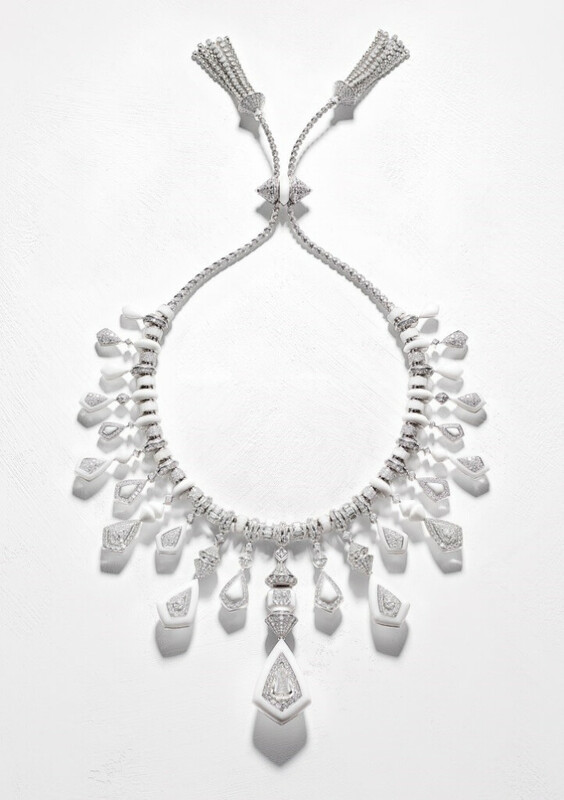 During the Biennale 2014, all the Café Society spirit irradiate in the splendid collection of 87 pieces of high jewellery that the Maison Chanel designed to celebrate a new esthetic language. These jewels remind us an era of whimsical inventiveness of Coco Chanel who launched in 1932 a diamond jewel collection that was unusual for the least. 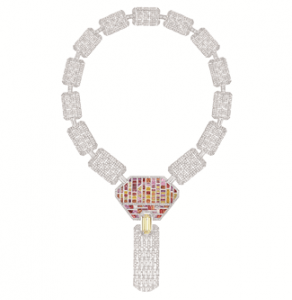 The audacity of the creation is pictured in the “Summer in New York” necklace with its unusual association of stones, colors and cuts. A central pattern , falsely regular paved with pastel lights retains a sumptuous yellow emerald cut diamond of 5,8 carats, 114 multicolor sapphires fancy cut totalizing 24 carats, is composing this blooming of emerald, princess, trapeze, triangle, geometric or asymmetric cuts which exemplifyies the long hours necessary for the jewellers to adjust this precious chess. 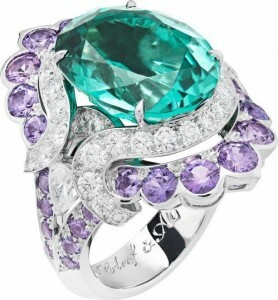 Every year, Chopard dazzles millions of spectators offering on the Croisette a parade of stones to the purest clarity. Allying the 7th Art to the art of high jewellery, the Maison Chopard has named Red Carpet the collection which, each spring, sublimes delicately these exceptional gems. 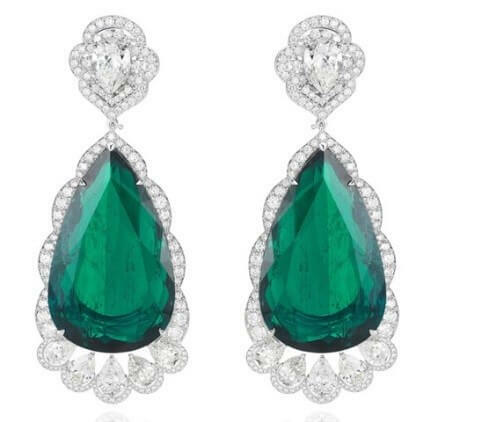 During haute couture fashion shows last summer, the jeweller has enriched his Red Carpet collection with extremely rare pear cut natural Columbian emeralds of 33 and 35 cts. There is definitely a couture spirit in these sumptuous earrings with diamond volutes seeming to be dancing around the face. 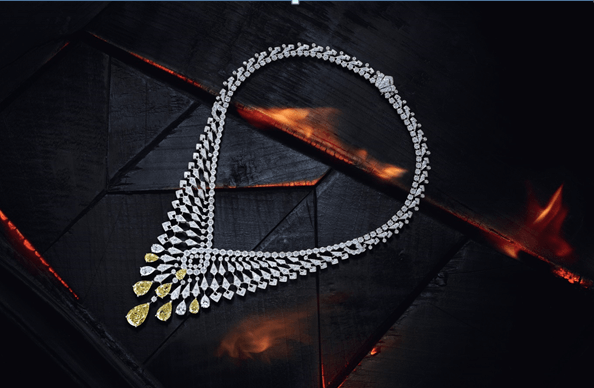 The precious stones are underlined by a festoon of airy diamonds punctuated by 5 pear-shape diamonds on its lower part. On the ear, the clip is adorned with a pear-cut diamond of exceptional quality. It will remain one of the most audacious of these last years, the Jodhpur necklace from the collection Bleu de Jodhpur from Boucheron is always triggering astonishment and admiration. 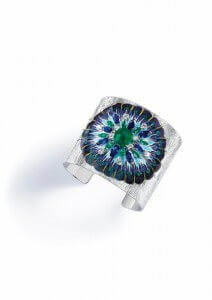 Imagine diamonds set into marble on one side and rock crystal set with diamonds and sapphires on the other side. This magnificent work to make it reverseable, where face is equal to reverse and the choice of precious or raw materials, either transparent, luminous or mat, result in a stunning necklace. 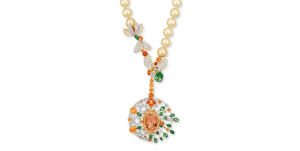 This unique piece is a tribute to Indian splendor, its artistic and cultural richness inspired by Taj Mahal, a hint with the marble of the necklace or floral art which is reproduced in the motifs inlaid in rock crystal. 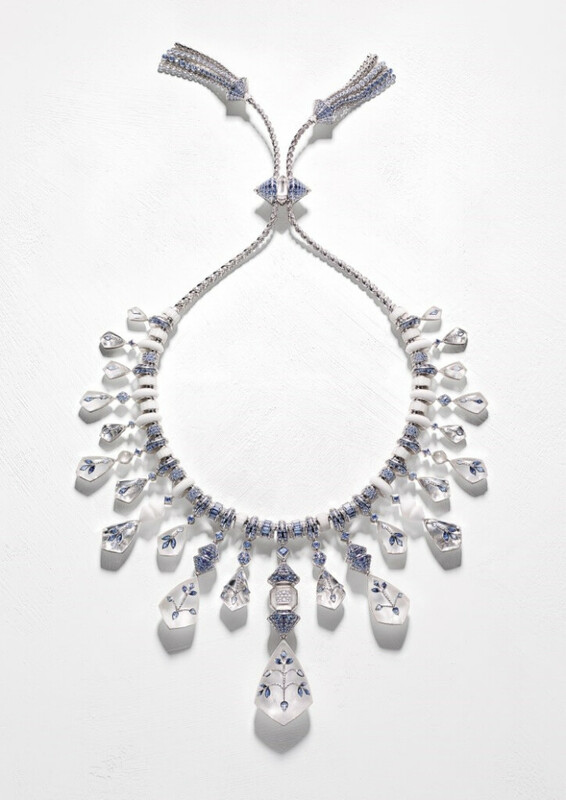 Designed with the contribution of the actual Maharaja of Jodhpur, whose ancestors were prestigious customers of Maison Boucheron, this high-jewellery collection, using sapphires lavishly, evokes azurean and indigo monochrome which built up Jodhpur fame. Apart from metal and stones, natural elements are rarely used in high-jewellery. 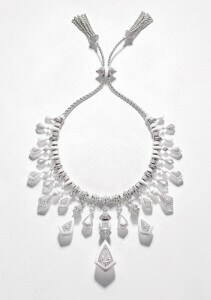 If Boucheron has chosen marble – surprisingly light on this necklace- Piaget selected feathers. Feathers were considered a luxury and small treasury in former fashion, they often came from remote countries and were scarce and costly. In the astonishing cuff bracelet from Piaget, no less than two hundred feathers were carefully selected in a wide color palette to match and sublimate the precious emeralds and sapphires. The electric blue or blue green tones of a steel throat bird of paradise, browns, greens, turquoise and whites explode in this array of feathers. In the center of this color deflagration a 3,46 carats emerald seems to shoot from fireworks. With this jewel, Piaget wanted to evoke a journey to Venice. This feather marquetry does indeed refer to the Pietradura technique born in the City of the Doges. he jeweller Nitot, who later became Chaumet, was among Emperor Napoleon the 1st official suppliers, had adopted the bee, then imperial emblem, in its creations. Still today, the bee is inspiring numerous jewels in jewellery and high-jewellery ateliers of chaumet up to the point to baptize the collection “Bee my love”. This bucolic and naturalist inspiration is an imprint in Chaumet’s creative patrimony along with other animals, but the bee held the queen role in becoming symbol of romantic love featured in high jewellery. The bee necklace evokes sweet, perene, luminous nature. 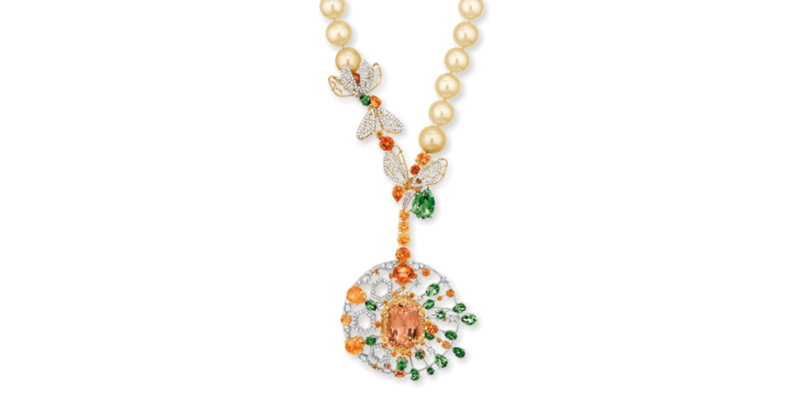 Bees empire is pictured with diamond alveolus, imperial topazes and honeycolour mandarin garnets, tsavorite garnets and green tourmalines like the stems of the flower on which they land. Golden beads even evoke creamy honey. Van Cleef & Arpels is inviting us to a long journey. Through its high jewellery collection named Seven Seas, the jeweller’s vision was released on the unlimited horizon line of seven legendary seas, symbolizing continents, succeeding to translate wave humors with gemstone language. Harmonious gradated blues, pinks or orangy recreate the luscious richness of the seas under changing, vesperal, incandescent, lunar or stormy lights. In order to reproduce the marine diversity of flora and fauna all the jewellers’ maestria has been mobilized to achieve the breathtaking beauty of this collection. In this precious lavish swirl « the Marine Knot Ring », submersed by a diamond and sapphire wave through which emerges, like an island, an electric blue-green tourmaline : simply flabbergasting. If high-horology aficionados know Breguet Manufacture very well, their new jewellery branch is more confidential, as step by step the Maison makes the commitment to create jewels that have a meaning. A Breguet jewel celebrate historical moments whether glorious, happy or even sometimes tragic. So is the case with Marie-Antoinette collection. The Queen was a fervent admirer of Breguet, the watch maker settled in Paris. One of her friends, just before she was imprisoned, ordered for her “the most complicated watch of the world”. The Queen was never to see it. 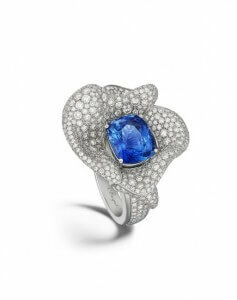 As a tribute to this story, Breguet baptized “The Queens’ Frills », ( » les Volants de la Reine”) this ring, a sapphire surrounded with diamonds set on a delicate frill. A noble way to remind that Marie-Antoinette loved precious fabrics and that all the European courts envied her dress elegance.